The global ampoule and syringes market demonstrates a highly dynamic and competitive landscape, finds a new research report by Transparency market Research (TMR). The market has been largely dominated by Becton, Dickinson and Co., Gerresheimer AG, West Pharmaceuticals, Schott AG, and Nipro Corp., which collectively, held a share of nearly 77% in the overall market in 2015. Hitherto, these companies have been concentrating on making heavy investments in R&D activities; however, their focus is likely to shift towards constructing manufacturing facilities in high growth regions, such as India and China in the near future. Apart from this. Strategic alliance with leading regional participants will be another key focus area for these players over the next few years, states the research report. As per the research study, the global market for ampoules and syringes, which stood at US$5.1 bn in 2015, is likely to progress at an impressive CAGR of 10.50% during the period from 2016 to 2024, increasing the opportunity in this market to US$12.4 bn by the end of the period of the forecast. The demand for glass ampoules and glass syringes has been much higher than other products in this market and is expected to remain so over the years to come. An exhaustive study of the geographical segmentation of the worldwide ampoule and syringes market has also been included in this research study. According to the report, the worldwide market for ampoule and syringes stretches across Europe, the Middle East, and Africa (EMEA), Asia Pacific (APAC), Countries under the North American Free Trade Agreement (NAFTA), i.e., the U.S., Canada, and Mexico, and the Rest of the World. EMEA has been leading the global market over the last few years and is expected to retain its position throughout the forecast period. The presence of a state-of-art medical and healthcare infrastructure, increasing shift towards home healthcare, and the rising awareness among consumers regarding the benefits of ampoules and prefilled syringes in the region. Europe has emerged as the key contributor to the EMEA market for ampoule and syringes and is anticipated to remain seated in this position in the near future. 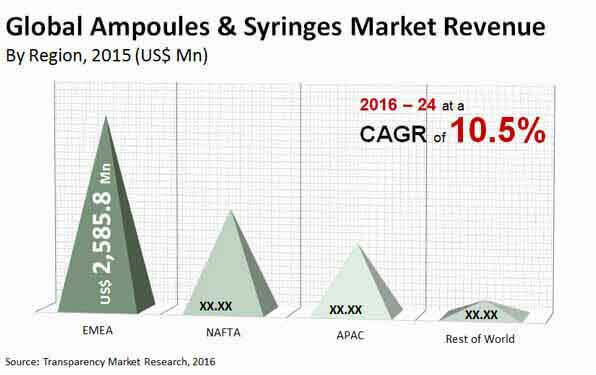 The NAFTA ampoule and syringes market is also expected to witness healthy growth over the next few years, thanks to the presence of a large number of leading pharmaceutical companies in this region, notes the study. “The substantial rise in the geriatric population suffering from various chronic diseases, together with the lower cost of progression-free survival (PFS) compared to hospitals or ambulatory service centers (ASCs) care, has augmented the trend of home healthcare, which is the main factor behind the growth of the ampoules and syringes market,” says an analyst at TMR. As syringes ensure deliver precise dosages, helping patients self-administer the medicine without any formal medical training, their usage in home healthcare and point-of-care administration has increased significantly. In addition to this, with considerable advancements in the biologics and biosimilars market, the demand for ampoules and prefilled syringes is expected to increase remarkably over the forecast period. On the FLIP SIDE, the increasing product recalls due to breakages and leachables and the high cost associated with the temperature-controlled packaging needed for temperature-sensitive drugs may hamper the growth of this market to some extent in the near future, states the report.